I’ve been a little slow with a couple of the reports so there’s now been a few updates to the website. Running has been a little patchy over the last few months and I’m still feeling the slight effects of the knee injury I sustained in the Monarchs Way in June so whilst I am running at the moment I’m definitely not fully recovered or fighting fit yet. However, when I see some of my Facebook friends not running due to more serious injuries then perhaps I should be happy I can at least do what I can. The one (only) good result from the Monarchs Way was that I managed to raise over £3k for the Alexander Devine Charity so a big thank you to everyone who supported and donated, this was very much appreciated. I’m sorry to say the Saturday Night Marathon events have also come to a close. Whilst I thoroughly enjoyed hosting these small low-key Marathon & Half-Marathon events and had some good feedback from the runners, it’s a lot of effort for a one-man band and I think I’ve fulfilled the desire to put on a few races and so have brought these to a close. Thanks to everyone who helped out or took part in the events, your support was much appreciated. I’ve just got to work out what to do with 50 Saturday Night Marathon medals now… Training runs Saturday Night anyone? 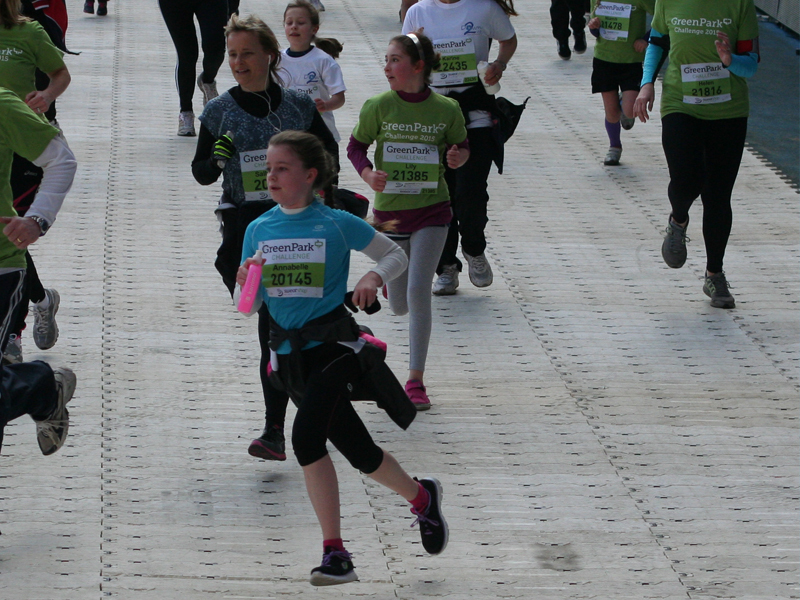 Finally, a couple of race reports have been added to the website. Firstly, was the ill fated second T184 attempt and DNF which you can read about here. This was a race which I should never have really started. 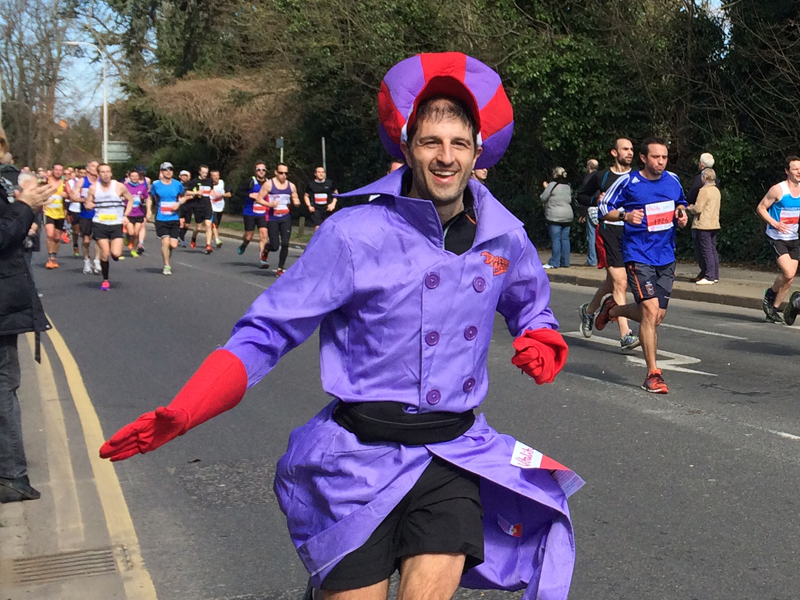 In addition there’s a brief write up of last weekends Rocky Marathon Triple weekend which you can read about here which started ok and went a little downhill but there’s a few amusing fancy dress pictures in the report. Hopefully I can make the start line of the Autumn 100 as I should really try and finish a long distance race this year! (2-1 down at the moment). Well my race plans for the second half of the year are starting to take shape with a successful entry into this years Spartathlon which saw a record 45 British entries submitted for only 25 places and a ballot taking place for the first time which unfortunately meant quite a few missed out this year and are currently on the waiting list (sorry guys). The increasing popularity of this event means that its likely to be heading towards automatic qualification entries only in future years in my opinion. 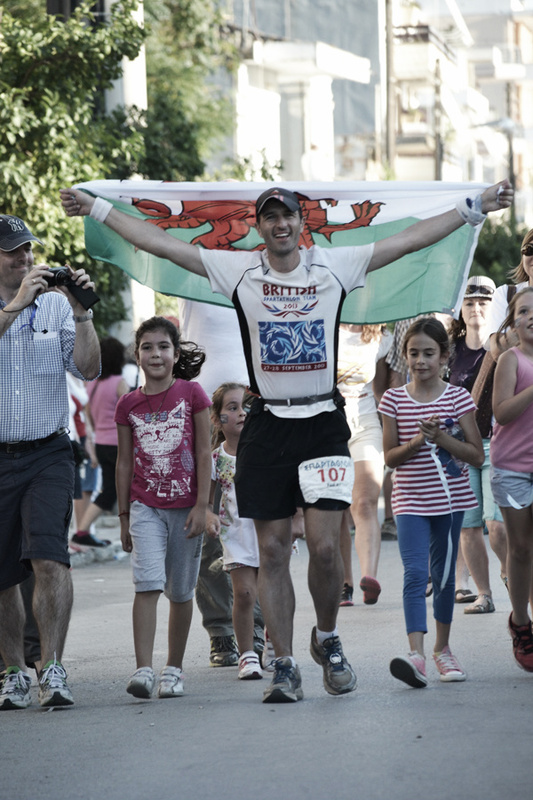 So if you have an ambition of running the Spartathlon then you had better start working on your sub-18 hr 100 mile times. 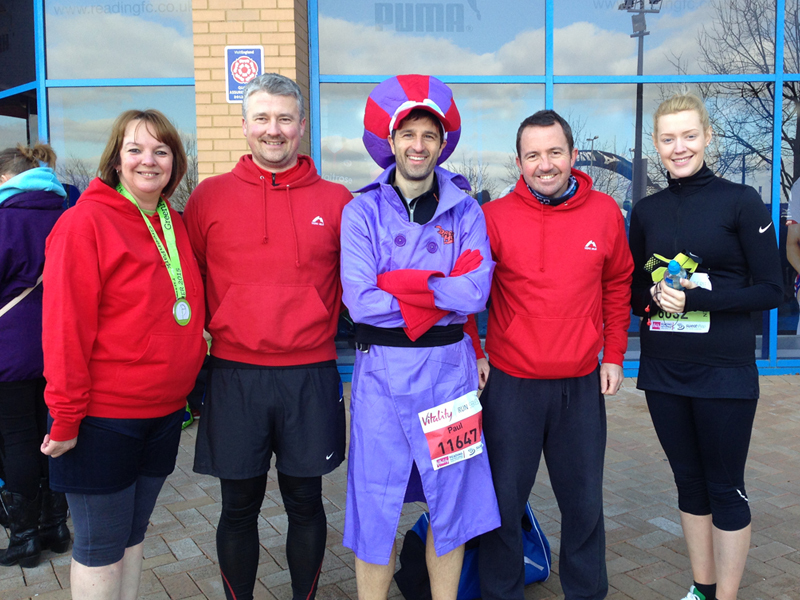 There has been a bit of a buzz around the 2015 British Sparathlon entrants and some sterling work behind the scenes from (Team Manager) Rob Pinnington to organise the team this year. In a matter of a few weeks, we have rebuilt the website, sought and obtained some sponsorship, working on some new designs and logos for the shirts, buffs, hats and building up the team momentum towards the event in September. The revamped British Spartathlon Team website can be found at www.britishspartathlonteam.org and I would like to add a few thanks to James Adams (for the original idea and work on the website which I have hopefully taken onto the next level), Peter Foxall (for some historical reports and photos), Rob Pinnington (for some info and the FAQ) and particularly Louis Waterman-Evans for use of his brilliant photos from the 2013 event which has really brought the website to life. We hope that with this infrastructure in place, one or two volunteers each year will take on the role of updating the website so we can continue to build the list of reports and information and be able to “hand-over” the website from year to year to a new team. The British Team is looking strong this year with a number of athletes who have represented the UK at ultra events and there is the usual mix of people who have completed the event before, a few who will tasting the experience for the first time and a few who will be returning to set the record straight. From a personal perspective my close running buddy Paul Stout has also secured an entry and we will be travelling to (and probably running) the event together. It doesn’t seem that long ago that the ‘comedy duo’ first lined up together at our first GUCR completely ignorant of the joys and pains of ultra distance running. It’s going to be a brilliant weekend which I am thoroughly looking forward to and it will be good to meet up with other runners and crews (of which there are several) so hopefully we will have a very visible presence at the event. Despite all the hype and anticipation, the key thing I need to keep reminding myself is not to be complacent this year and give it as much focus as I did in 2013. One finish does not guarantee another. 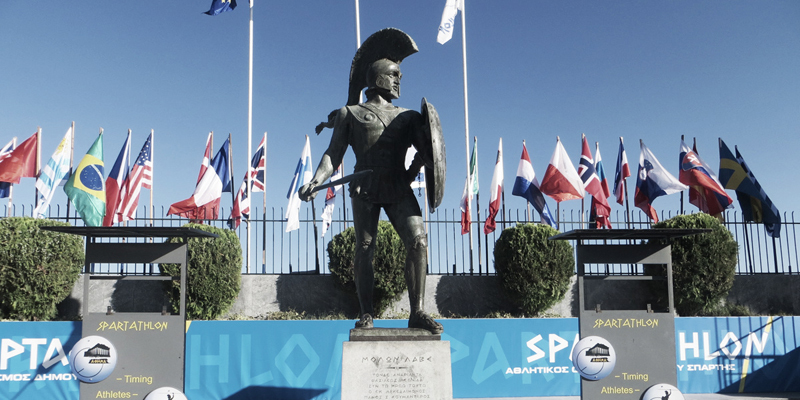 So with end of Spartathlon at the end September confirmed, it means the T184 will have to wait until 2016 (I will be helping out at the event anyway) and I’ve pencilled in a couple of marathons as training events in the build up. 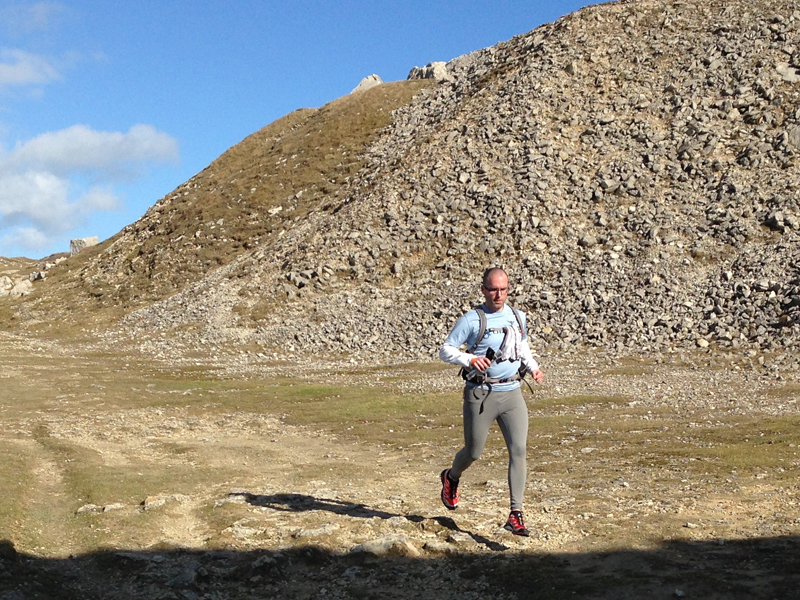 The previous 2015 race plans blog (here) has now been updated. 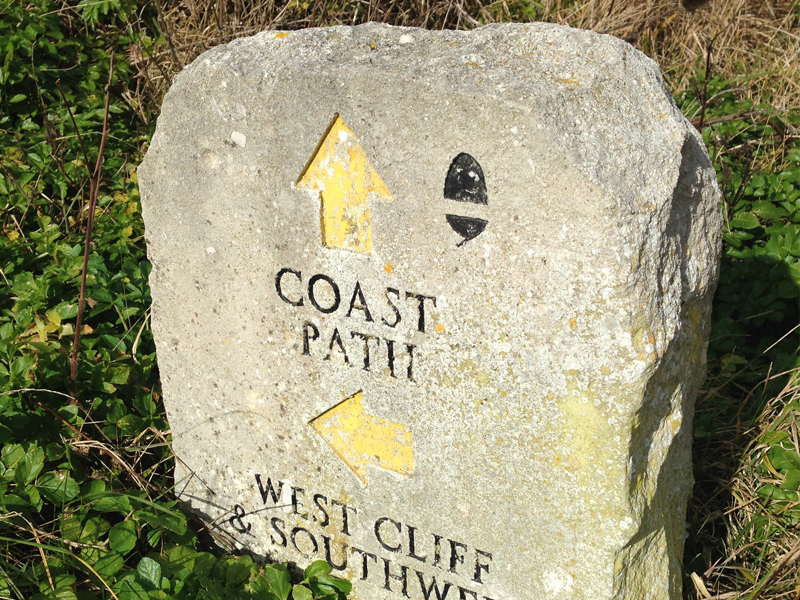 The Oner is ultra trail run along the South West Coastal Path which is held mid-April each year. The event starts at noon and competitors have 24 hours to cover the 80 miles (including a loop around Portland) finishing at Studland Bay. I thought a recce of the course was worthwhile to check out the terrain and navigation as it was just a couple of hours drive from my home. Despite, it sounding fairly straightforward to follow a coastline I would be covering half of the route during the evening/night and some familiarisation would be helpful even if its just to spot the odd landmark. I was joined by Keith Godden for the weekend who is also taking part and we worked out some logistics where we could meet up and leave a car at the start and end of the run. On late Saturday morning we set off from the Race HQ at the Ferry Inn and completed a loop of Portland before returning to the car, topping up our water supplies and heading off for the Lulworth Cove. 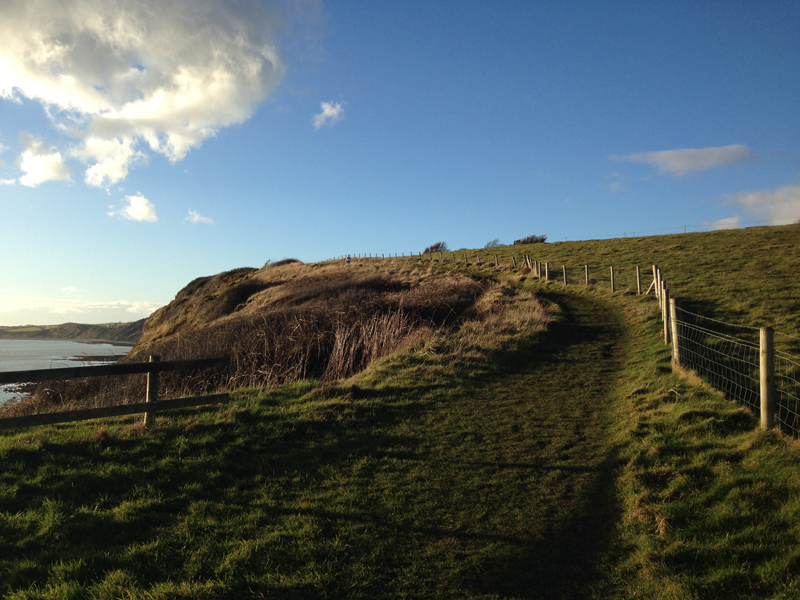 For a mid-February date, the weather was pretty good which afforded us some fantastic views of the coastline and we ran and hiked along the coast for a few hours. In the early afternoon, we stopped off for an ice-cream at a small café and ended up chatting to a couple of people running the place who spotted Keith’s map and asked where we were going. In a funny coincidence they were also taking part in the Oner and we had a brief chat before continuing our journey, so a quick hello to the Sandstone Racers I think they were called. After heading through Weymouth (which I didn’t enjoy so much and much preferred the quieter trails) we started to cover a particularly grotty section which was pretty muddy. It became a little harder going after being on your feet for a few hours but we plodded on. There were a few sections where you are pretty close to the edge or there’s a fairly steep descent and so some care will need to be exercised when travelling this section at night. Navigation wise, it wasn’t difficult to follow the general direction but there are a few other footpaths which come off the route so its possible to go off track. 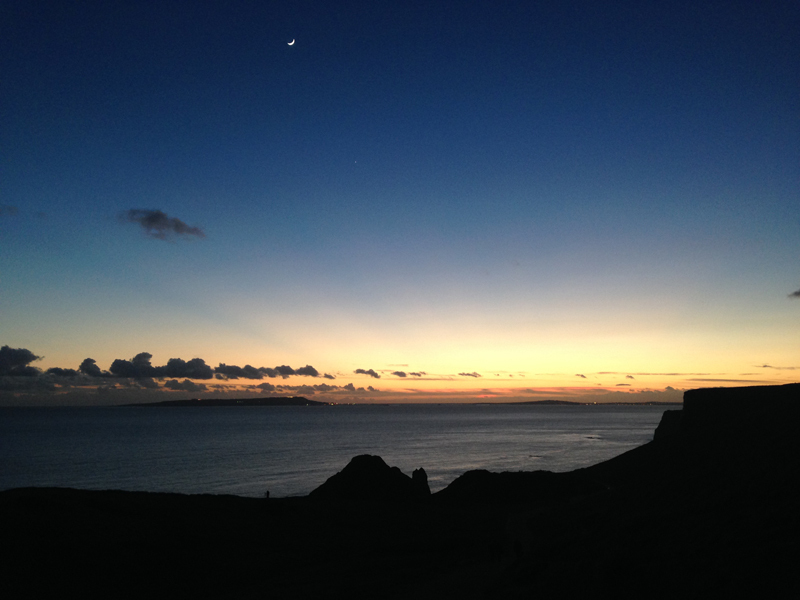 I snapped another few pictures and got a great view of Portland from near Lulworth as the sky was getting dark and the moon was out and you could start to see the lights on Portland. We covered the last half an hour in the dark as the sun set. 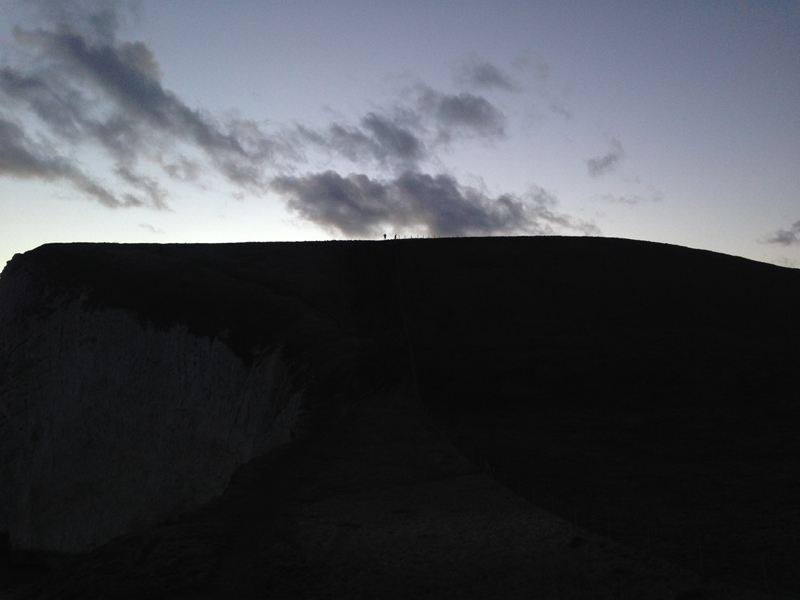 We had both taken the mandatory kit for the practice run so were well equipped with layers, food and head torches and finally arrived at Lulworth Cove where we enjoyed a hot meal at a local pub. 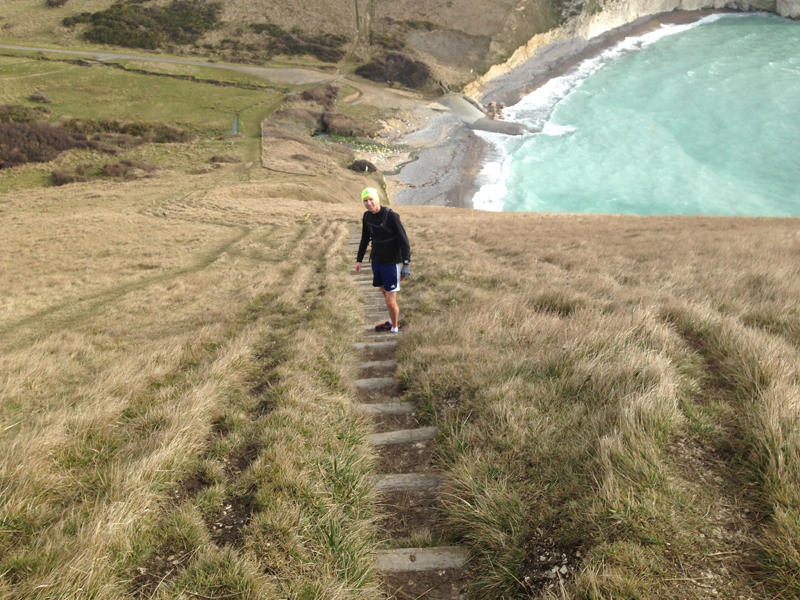 The next day we were joined by Matt Coggins as we set out from Lulworth to recce the leg to Swanage. Interestingly, a lot of the elevation on this race comes in the last third and we spent a few hours going up and down various slopes along the coast. The weather forecast had suggested heavy rain early afternoon and we had hoped to cover the majority of this section before it really set in but we were armed with waterproofs and extra layers if needed. This next section was another mud-fest in places. I had switched shoes from my Inov8 Race Ultra’s (which are comfy but poor in the mud) to a pair of Inov8 Traiiroc 255 which afforded a bit more grip. However, when the mud is really thick then no shoe is going to help you and there were parts when we were slip sliding all over the place. I also took a nice tumble at one point as I slipped in some mud mid-stride and fell as Matt ran past me trying to stifle his laughter. We came across one little section where the path appeared to have been re-routed to some landslip and had to do a bit of scrambling up and embankment before we spotted the correct route. It was a proper “hands and knees” effort at that point! 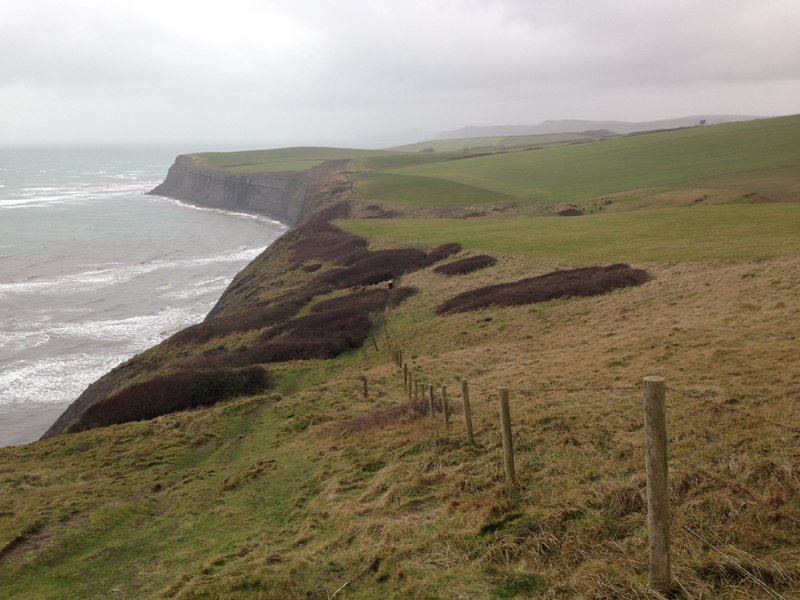 To make matters worse, the wet weather came in a little sooner than expected and the last ten mile section was pretty soul destroying as we were buffeted by a fierce wind and felt the impact of cold stinging rain on your face and legs for a couple of hours. Towards the end of our recce I had four layers of clothing on plus full waterproof cover, waterproof gloves and I still felt cold. It was pretty horrible.. character building stuff as they say. There were times when the wind was so strong it was pushing you along, thankfully it seemed to be more of a tail wind than head-wind. However, I was getting a little irritated by the sound of the wind rattling the hood of my waterproof after a while. The upside is that we probably experienced worse conditions than we will in a couple of months time (here’s hoping!) 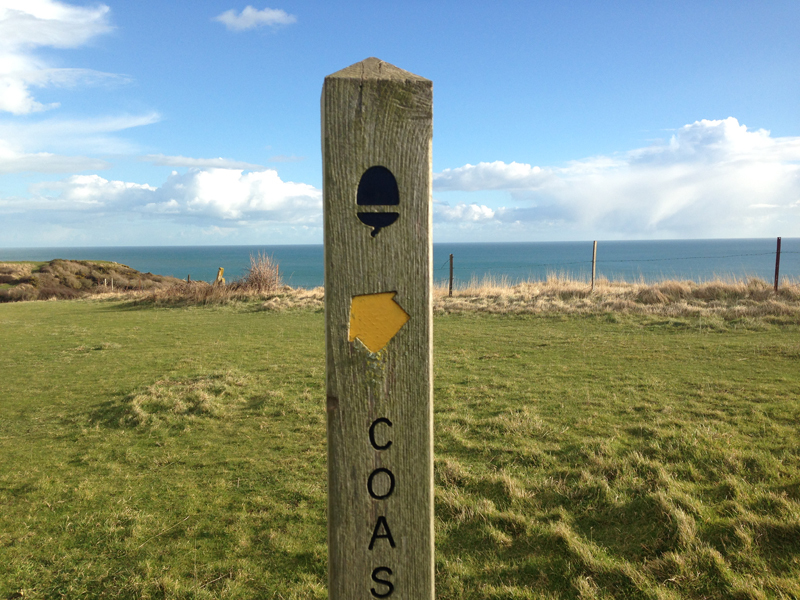 and this has helped me plan a few items of kit as it could be pretty cold at night on an exposed coastal path so some lessons to take note which is exactly the purpose of the recce. 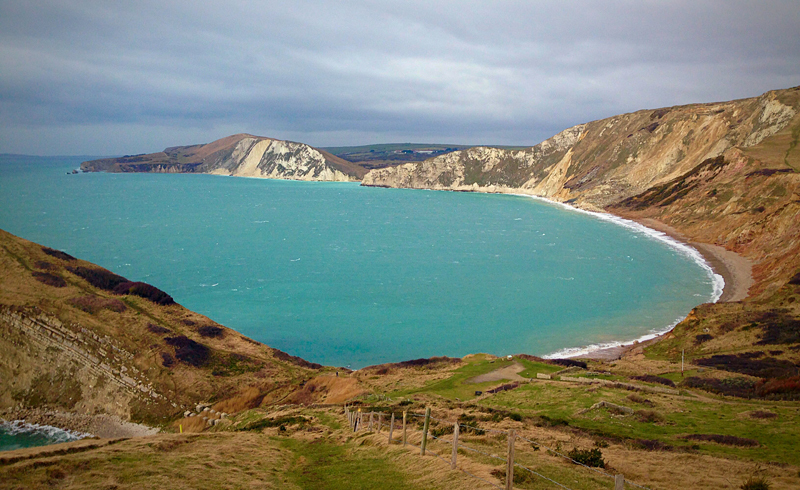 We trudged the last few miles to Swanage and back to our car. It took me a good hour or so to warm up afterwards partly helped by a traditional fish and chip dinner. The take-away points from the recce include getting a bit more familiarity with the route, a better sense of how my pacing will go on the event (i.e. lots of hiking and not a huge amount of running! ), footwear choice will depend on the weather up to the event. If it’s wet, then I will probably wear something with better grip for the second half and I will definitely make sure I take plenty of layers/gloves/hat etc for the night section especially as there’s more elevation, it will be dark, pretty exposed and the pace will slow. I can see lots of people taking poles for the second half of the race. Finally, for navigation purposes I might even dig out my super powered Lenser H14 for some added confidence on spotting the cliff edges during the night. Thanks to Keith and Matt for the company on the weekend. It was a tiring weekend with the running, hiking and travelling and not much fun on the second day but a useful trip for a training and recce’ing perspective. 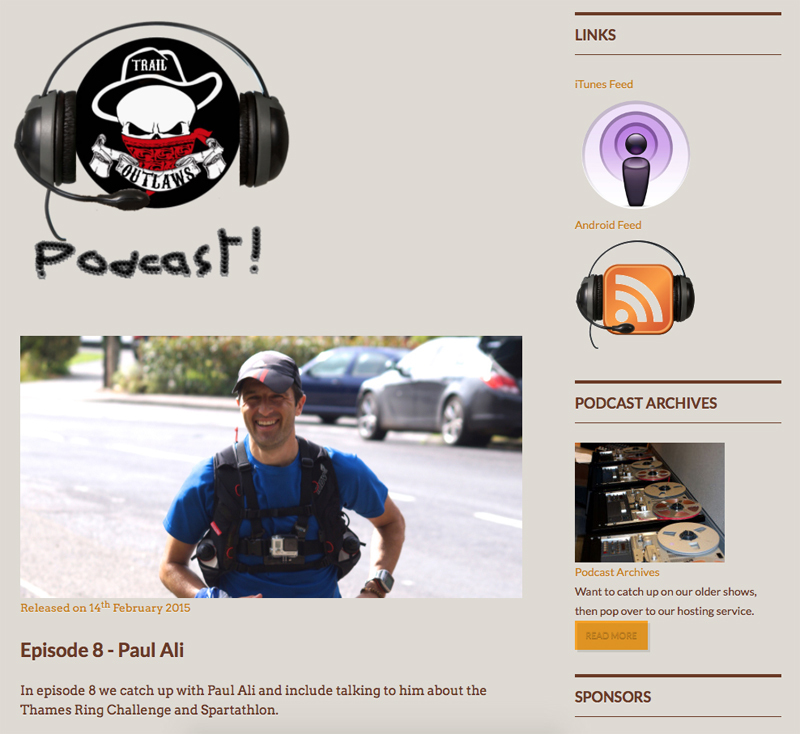 Just a quick note to say it was a pleasure to be interviewed by Tim Bateson for the latest episode (No 8) of the Trail Outlaws podcast.